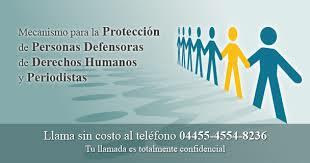 Nearly two years after its creation, the Mechanism for the Protection of Rights Defenders and Journalists in Mexico finds itself in a delicate moment, in light of the resignation of its head, Juan Carlos Gutiérrez Contreras, on 15 March, a situation has led to multiple questionings regarding its efficacy. On 24 March, civil councilors of the Mechanism retired from the Governmental Council headed by the subsecretary for Governance, Lía Limón García, given their view that there do not exist adequate conditions for its functioning. Since June 2013, civil-society organizations have presented a diagnostic regarding deficiencies within the Mechanism. At present they identify structural failures: the impossibility of having a stable and qualified team due to constant firings, the fact that the full budget set aside for the organism is not yet accessible, and a delay in attending to cases. Edgar Córtez, one of the civil councilors, detailed for example that until February of this year, the mechanism had received 152 petitions for aid, of which 22 were rejected, 89 were pending, and only 41 had been reviewed and discussed. This implies that at least 70% of the requests have not yet been considered. This entry was posted on Sunday, March 30th, 2014 at 9:16 am and is filed under Chiapas, Human Rights, Human Rights Defenders, Indigenous people, Justice system, Mexico, Militarization, Paramilitary, Political Prisoners/Prisoner of Conscience, torture, Women, Youth. You can follow any responses to this entry through the RSS 2.0 feed. You can leave a response, or trackback from your own site.